Shillong Lajong began their campaign in 2016 Shillong Premier League with a 2-1 win over Rangdajied United FC. Samuel Lalmuanpuia gave the lead to the Reds in the 18th minute with a free kick. This was the only goal scored in the first half. 15 minutes into the second half, Redeem Tlang doubled the lead for Shillong Lajong with a stunner from 25 yards. Rangdajied United pushed forward continuously and were able to reduce the deficit in the 72nd minute when K. Thopi converted a corner kick. 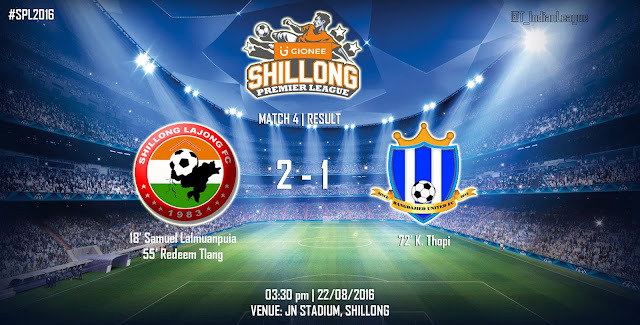 The match ended with a scoreline of 2-1 in favour of Shillong Lajong FC. Langsning SC take on Nongkrem S& CC in the next match of Shillong Premier League tomorrow at JN Stadium.